On this page you can find a list of the most important program features, in most cases with a short explanation of the feature. For a complete list please take a look at the users guide which can be found in the customers section of this page (registration required). Music information in SkyConductor is not only playable but also displayed in graphical means. This enables you to place cues as accurately as possible on each important spot in the music. The display is zoomable and the displayed amplitude can be amplified in order to make editing quiet passages easier. Directly below the display of the graphical music information there is a field where all cue points are shown. Effect rise time (green) and duration (red) are both displayed here. The change in color (green to red) marks the point of time where the effect will become visible to the viewer (bursting point of shells etc). The cue can easily be dragged on the timeline to place the cue more accurately. Also, this view enables you to find and correct "black spots" within your show. Besides the graphical representation of the show's cues, SkyConductor also provides a feature-rich showscript-editing mode which is similar to the one you are used to from Microsoft Excel(R) or similar products. All cues and effects included in your show can be viewed and edited in text format by using keyboard or mouse. 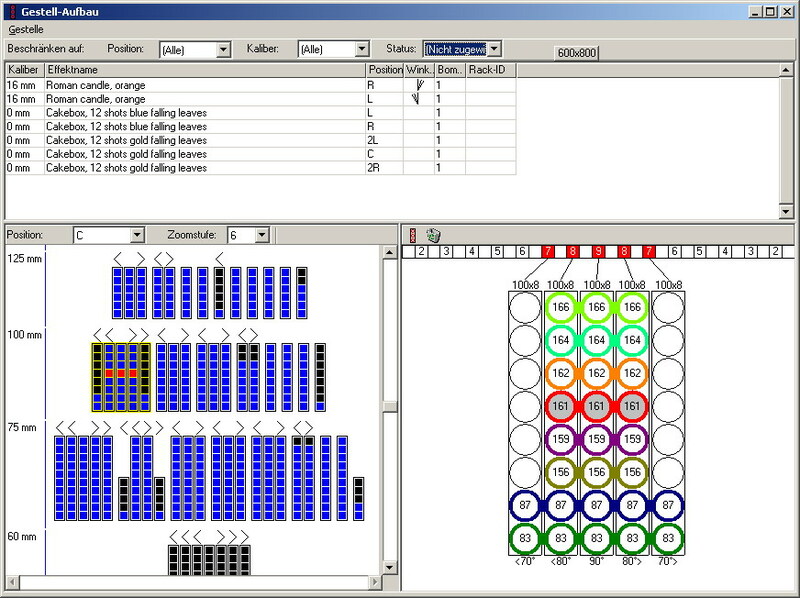 This enables you to quickly enter effect data, angles or other cue/effect properties. Besides the defautl columns like rise time, duration, absolute effect time, caliber, shooting locations and angles you can also define your own columns to provide data that was not included into SkyConductor by default. To make the selection of effects as easy as possible while editing a show, SkyConductor has included an inline search engine. That means that while you are typing SkyConductor already looks for matching effects inside the stored effect database as well as inside the already existing show. That way you don't even have to create an effect database to start working efficiently with SkyConductor. Just start a new show and begin placing effects - SkyConductor will remember everything you have already entered and fill in fields like rise time and effect duration automatically. SkyConductor enables you to enter shooting angles and positions for each cue. These values are taken into account in all other parts of the program. Each printed label includes angles and positions, each time you assign ignition addresses automatically these values are considered as well. 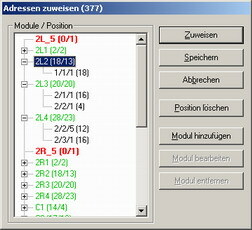 Each cue can have up to 256 positions; each of them including different shooting angles. 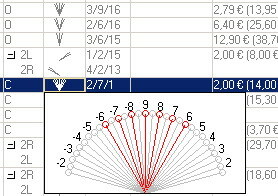 Unlike in other programs, these angles are not set by typing in numbers which are difficult to understand at times. With SkyConductor you can see the angle that you're shooting an effect in visually while editing it (see screenshot to the right). You can change these angles using the mouse or by just pressing hotkeys on your keyboard. To be able to use features like the automatic placement of mortar racks you have to tell SykConductor which effects cannot be seperated into two different racks. That's why SkyConductor supports pyrotechnic delay chains. It includes a powerful chain editor that can either be used as a seperate dialogue box or accessed directly from the showscript. It makes it possible to edit every single effect of a chain, including the preceeding delay. Of course you can also use helper functions like the chain wizzard which can build entire chains at once, only limited by the length of the chain specified by the user. Of course SkyConductor can handle both chain types used by pyrotechnicians: delay in the main fuse or delay in each shell fuse. SkyConductor also calculates resulting rise time and chain duration for you so that this tidious job is automatized. After editing a long chain, you can simply collapse all included data and more or less "shrink" all the information into a single line so can always see "the whole picture". SkyConductor's effect database is useful to manage all of your effect's properties. You can use it to select effects more easily when editing shows. 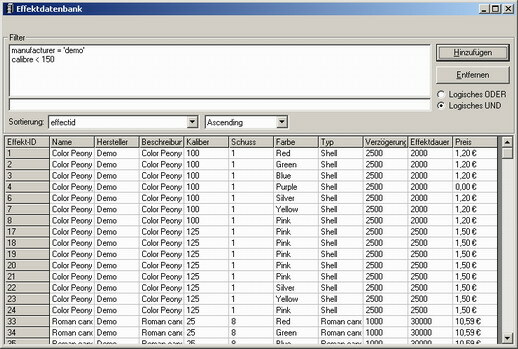 All relevant props like prices, calibers, color, effect type and name, shot count, rise time and duration are included here and are assigned to the cues automatically if an item is selected via the inline script search. It is planned to provide downloadable effect databases on the SkyConductor-website in the near feature. You will also be able to upload your effect database onto the server to share it and maybe even charge other people money for using your information. SkyConductor also includes a simple stock management system although in most cases it should be possible to integrate SkyConductor into a full-blown stock management system. In both cases SkyConductor will display a stock report after you book in/out a show from the inventory. So called plugins make SkyConductor hardware-independent. In addition to the main program you purchase a small cheap piece of software which can then be chosen in the program's "select ignition system"-dialogue to work with the selected system. You don't have to buy this plugin though. There is a development guide available on the SkyConductor-website which explains the interface in details. This makes it possible for any computer programmer to develop such a plugin and adapt any ignition system available on the market. This also means that you can interface your own home-built ignition system with SkyConductor. The plugin-approach makes it possible to switch ignition systems with ease, you can even use multiple ignition systems at the same time (= TWO or more systems in one show!) without the need to work with different computer programs; you can program all in one show! Depending on the ignition system used you can either export the show to the ignition system prior to shooting or shoot directly from SkyConductor. Measuring ignition circuits from within the program is also supported for some systems. Even for users not equipped with computerized ignition systems SkyConductor offers many advantages: The easy timing feature makes it possible to fire pyromusicals even in the old-style way of using a switch for each circuit. 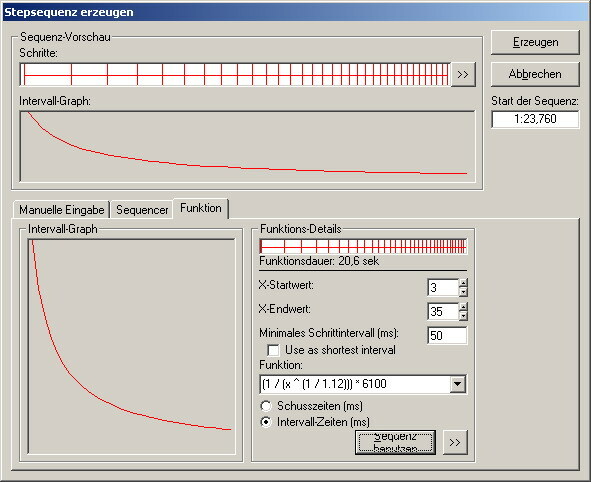 Shooting cues accurately this way is done by visualizing the ignition time of each cue by converting the time remaining before ignition to a specific graph in the EasyTiming-window. This way the operator can almost feel the cue approaching as the time ticks which makes it possible to accurately hit the switch at precisely the right time in the running show. SkyConductor supports pyromusicals as well as standard shows without music. 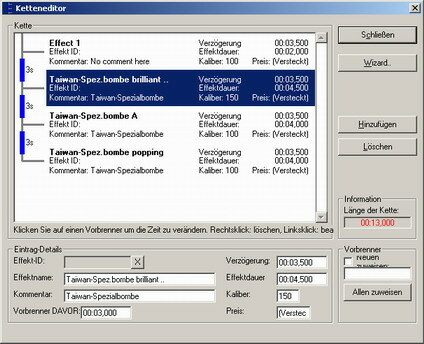 Resulting from this there are three different firing modes available to specify for each cue: automatic, semi-automatic (stepping feature) and manual. These modes are usable depending on your ignition system. Of course you can also assign backup cues. Some ignition systems have a fixed addressing system, so that addresses can not be assigned in a row. SkyConductor has been equiped with a feature to automatically handle these situations. Normally you would assign the cues one by one while marking the addresses used in some spot. SkyConductor takes this job and reduces it to assigning ignition modules to certain locations in the show setup. Every cue is assigned one or more ignition addresses (depending on the number of locations) this way. Of course you can also assign cue addresses in a row if that's supported by your ignition system. This is useful if you can set the channel address on the ignition module itself. The task of calculating the needed mortar racks is sometimes very tedious. Angles, shells per chain and caliber sizes must be taken into account to ensure you take with you as few as needed but also as many as needed. SkyConductor does this job for you. It takes a look at the effects included at the show, uses angle and chain length to figure out the best setup configuration there is. Of course you have to define what kind of racks and most importantly how many of each shot quantity and caliber you have available. Of course you can also do this task manually if (which is very rarely the case when you run out of racks) the automatic setup cannot be fully completed. After you have virtually set up the show on the screen you can of course print out the whole planned setup in form of a map, which shows each rack and the effect to be loaded in each mortar. Also, the automatic address assignment-feature uses this setup plan to make sure that cues that are shot with the same cue are placed next to each other and also close to the ignition module so you don't have to use a lot of cable. SkyConductor makes it easy to create effective step sequences. Times of stepping intervals can be entered manually, be determined by some options (same interval, speeding up/slowing down, speeding up - slowing down, slowing down - speeding up) times and more or fixed by entering a formular to calculate step intervals or absolute step times (format: f(x) = ...). With this methods, even very complex step sequences can be created at ease. SkyConductor supports printing various informative reports and labels. These contain every information you need to set up and fire your shows. The cue list contains the complete showscript, including all information available about cues and effects so it is a useful tool if there is anything unclear about the setup. Of course comments can also be included. Additionally various lists can be created containing the material needed to fire the show. Of course this includes e-matches and pyrotechnic delays to build effect chains. Some of the more specialized lists include setup plans/maps, module connection plans, effect labels (including angle and rack ID if applicable), transportation documents and some more. For a preview of the reports please take a look at the pdf files provided in the download section of this page. With SkyConductor you can constantly keep an eye on the cost of your show. Included in the calculation are not only effect prices themselfes but also prices of e-matches and pyrotechnic delays. For every cue a margin can be defined to make some parts of the show cheaper if for example old material is used. In the same manner a part of the show can of course be made more expensive if for example an effect is no longer manufactured. For a complete list of all features available with SkyConductor, please consult the software manual which can be found in the download section (you have to create a free user account in order to download the manual). - The english manual will be available shortly!